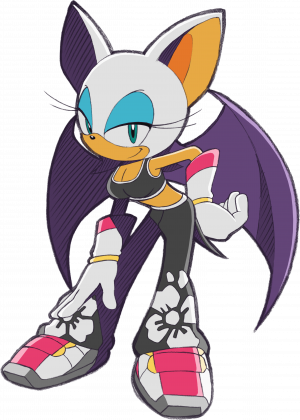 Rouge the Bat (Japanese: ルージュ・ザ・バット, Rūju za Batto) is a is a recurring character in the Sonic the Hedgehog games and related media. Introduced during Sonic Adventure 2 in 2001, Rouge is a jewel thief and also an occasional government spy for G.U.N. and the United Federation. A free agent regularly operating as an unrepentant criminal, Rouge can be found fighting against Sonic and his friends as often as with them, having teamed up with Dr. Eggman and Dr. Nega on more than one occasion. The bat is not above exploiting her charm and good looks if it helps her get what she wants: treasure, and lots of it. “ Rouge the Bat is an enigma. As a spy, a freelance treasure hunter, and a member of Shadow the Hedgehog's Team Dark, Rouge's motivations are always in question. In truth, she's usually just out for herself. Her part-time work as a GUN agent often sees Rouge team up with Shadow the Hedgehog, while her full-time work as a jewel thief frequently pits her against Knuckles the Echidna. While the bat usually has little patience for anything that doesn't sparkle, her attitude towards the Ultimate Lifeform and the Master Emerald's Guardian are a little more ambiguous. Sonic Adventure 2/Sonic Adventure 2 Battle; Sonic Battle; Sonic Heroes; Shadow the Hedgehog; Sonic Riders; Sonic the Hedgehog; Sonic Riders: Zero Gravity; Sonic Free Riders; Sonic Rivals; Sonic Rivals 2; Sonic Chronicles: The Dark Brotherhood; Sonic Colours (Nintendo DS), Sonic Generations (HD). In Rouge's very first appearance, we see her fighting with Knuckles outside Eggman's Pyramid Base. The bat has apparently somehow stolen the Master Emerald from Angel Island, but is enjoying very little success in convincing the Guardian to just stop pursuing and let her take it. Knuckles shatters the Master Emerald to keep it out of her (and Eggman's) hands, thereby beginning both the echidna and the bat's scramble to recover the shards and rebuild it. In addition to this, during SA2 Rouge works as the President's specialist agent to spy on Doctor Eggman's schemes aboard the Space Colony ARK, and compile a report on Professor Gerald's Ultimate Lifeform project. To assist her infiltration, Rouge makes the appearance of teaming up with Eggman and Shadow, participating in the bombing of Prison Island and the laser destruction of the moon. However, during the Last Story Rouge reveals her true allegiance, and helps avert the colony drop during Cannon's Core. Rouge's revised design in Sonic Heroes. Rouge brings about the formation of Team Dark in their opening sequence of Heroes. Sneaking into a secure base looking for "Eggman's secret treasure", the bat instead finds Shadow the Hedgehog (or is it?) and E-123 Omega, both in suspended animation inside a deep storeroom. After a brief firefight, she orchestrates the trio's at least temporary alliance under the premise that they all want the same thing: to get to Eggman. Rouge serves as Team Dark's presumptive leader and Fly Type member during their first outing; her moveset includes Thunder Shoot and Dummy Ring Bomb. 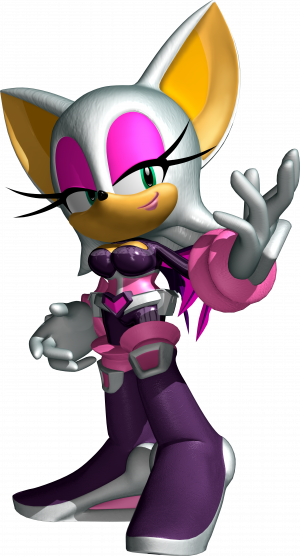 Heroes was unusual for Rouge in that she sported a unique new design during this game, although the bat reverted to her SA2 getup for subsequent outings. Rouge also winks at the player, if they look at her in first person mode, which no other team does. Appearing as one of the partner characters in Shadow the Hedgehog (game), Rouge is found in three levels: Digital Circuit, Death Ruins, and GUN Fortress. She seems to be working for GUN all the way through the game (if you believe her). In Digital Circuit and GUN Fortress, she asks for Shadow's help in keeping the United Federation's Chaos Emeralds out of the Black Arms' hands, while in Death Ruins she's fighting alongside the regular GUN army to battle a retreating alien squad in the jungle. Like all partner characters, Rouge can be controlled by a second player, though her move set is limited to the melee attack and Homing Attack. Rouge's story in Sonic Battle is the third of eight, after Tails' and before Knuckles', although chronologically, hers actually starts first, and bits and pieces of her plot crop up in other character's stories too. 3 days before the main story begins, the President of the United Federation personally assigns Rouge to investigate Emerl, an ancient war-robot stolen by Dr. Eggman. Her search leads her to the Doctor's hideout in Gimme Shelter - at exactly the same time as a hallucinating, weakened Shadow Chaos Controls into the place. Rouge carries the "Ultimate Lifeform" out of the complex after he is taken down by a single Guard Robo, much to the bat's incredulity (and annoyance). Shadow spends most of the rest of the game babbling deliriously in his sleep inside Club Rouge, a nightclub in Night Babylon which Rouge apparently owns. Meanwhile, the bat decides to acquire Emerl for herself, reasoning that a mimetic combat robot would make an excellent accomplice for a criminal like her. To this end, she manipulates Sonic and Tails until they accidentally assign Emerl to follow Rouge's orders. Pursued by Amy, Rouge takes the robot back to Club Rouge for training, before robbing the Emerald Town jewelry store in a daring daylight heist. Rouge's plan backfires, however, when Emerl absorbs the stolen Chaos Emerald into his systems, rather than keeping it for the bat to gloat over. Exasperated, Rouge surrenders the robot back to Sonic and flies off. Rouge in her Extreme Gear racing outfit for Sonic Riders. Rouge blows a kiss to an opponent, distracting them and making them lose their balance. Rouge attacks a nearby opponent with a spinning back kick that stuns them temporarily and knocks them off balance. Rouge attacks with a bomb that will home in on an enemy, which will stun them, allowing you to leave them in your dust. Here Rouge receives much the same treatment as in the first Riders: plays no part in the story, but is unlocked for free races after clearing the Hero story. Again, her special move is the Bat Cracker, which homes in on an opponent. The bat picks up her GUN Secret Agent mantel again Sonic '06, serving as the means by which Shadow's story begins. Rouge's loss of communication during a mission to recover the Scepter of Darkness from Eggman's White Acropolis prompts GUN to send Shadow in after her. The two rendezvous and proceed to the extraction point in Kingdom Valley, but a botched ambush from Eggman results in the release of Mephiles the Dark. Rouge and Shadow are catapulted into the future by the vengeful demigod, and have to work with Team Sonic to return to the past. Rouge cannily exploits time paradoxes on her return, finding Omega in Tropical Jungle and shutting him down for centuries in order to deliver the Chaos Emerald that Shadow needs to fight Mephiles Phase 1. After Shadow and Omega return again to present-day Soleanna, Rouge accompanies the rest of Team Dark in pursuing Mephiles across Wave Ocean and Dusty Desert. Finally, at the End of the World, Rouge helps gather up the Chaos Emeralds needed to resuscitate Sonic - finding the purple gem in a collapsing Wave Ocean. Although not a playable character in Sonic Rivals, Rouge does have a place in the game's plot as part of Shadow's story. The thief sends a garbled message to Shadow after discovering that the "Eggman" wreaking havoc on Onyx Island is in fact Eggman Nega - but before she can relate this to the Ultimate Lifeform, Nega zaps her into a card mid-transmission. Shadow spends the rest of the game pursuing Nega to rescue both Rouge and the genuine Eggman, and narrowly prevents Rouge's card from being consumed aboard the Egg Destroyer. At the end of the game Rouge thanks Shadow and suggests that they go treasure-hunting together; the black hedgehog is typically unenthusiastic at the prospect. 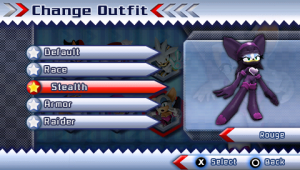 Rouge's unlockable stealth suit outfit in Rivals 2, first seen in Sonic X. In the second installment of the Rivals series, Rouge gets a much expanded role as one of the eight main playable characters. Assigned by a mysterious unknown client to gather the Chaos Emeralds, Rouge manages to rope Knuckles, of all people, into helping her. After acquiring an Emerald detector from "Eggman", the duo search from the greco-roman shores of Blue Coast Zone to the spooky graveyards of Mystic Haunt, securing six of the seven gems. Metal Sonic and Shadow inadvertently bring the seventh into close proximity, opening a dimensional door to Chaotic Inferno Zone. By now Rouge has had more than enough weirdness and duplicity for one adventure, and decides she's finished being Nega's unwitting pawn. Knuckles has other ideas, and physically drags Rouge into Chaotic Inferno where they fight the Ifrit. Rouge is one of the recruitable party members in Sonic Chronicles: The Dark Brotherhood. She is encountered towards the end of Chapter 1 in Central City near GUN HQ, and takes Sonic to see the GUN Commander after Tails has been picked up at his workshop. The Commander tells Rouge to work with Sonic's team and report back to him - irrespective of the hedgehog's objections that no-one trusts her. Rouge is at her most snide during Sonic Chronicles, frequently making sarcastic remarks about whatever unpleasant situations the team happens to find itself in. Aside from Shade, she is the only character who can use the Stealth environmental ability, useful for sneaking past auto-cannons on the Zoah Colony. Her multi-character POW moves see her team up with Shadow, Omega, and Knuckles, while one of her solo moves, Jewel Storm, is the only attack in the game that can deal armour piercing damage to all enemies. Although Rouge technically spends the entire game as a GUN attaché, she doesn't seem to take her duties all that seriously. One sidequest sees the bat ask Sonic to gather up pieces of Nocturnus technology for the GUN scientists to study, but by the end Rouge is so sick of seeing pieces of damaged machinery that she bribes Sonic to stop bringing her stuff. Relieved, Rouge declares that she'll get back to "doing something important, like sitting around looking pretty". The Nintendo DS version of Sonic Colours sees Sonic find many of his friends exploring Dr. Eggman's Amazing Interstellar Amusement Park. Rouge, along with Knuckles the Echidna, is found in Starlight Carnival, where she's snooping around on behalf of an unidentified client. Luckily, this doesn't end quite as badly as it did last time; and the bat doesn't do much investigating, either, spending most of her time taunting Knuckles. It eventually transpires that she's the reason the echidna's even in the park, after Rouge forged a letter from Eggman summoning Knuckles there. Rouge does not appear in the Wii version of Sonic Colours. In the game's opening cutscene, Rouge is attending Sonic's surprise birthday party with a host of other friends. Time Eater's interruption casts her into the bleached white void along with everyone else; Rouge winds up outside City Escape. After she's re-vivified, Rouge has two challenge gate missions for Sonic: classic City Escape, where she races Sonic while throwing bombs a'la Sonic '06; and modern Seaside Hill, where Rouge "uses her wiles" to distract the Shield Egg Pawns so Sonic can homing attack them. Rouge also appears in DS version of Mario & Sonic At The Winter Olympic Games dealing for Whitestones, so Player can get more Memorabilia in the Gallery.